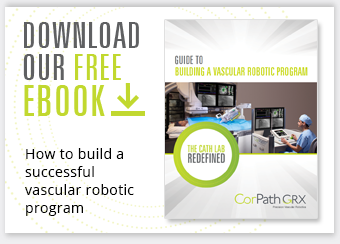 The CorPath® Vascular Robotic System is the first FDA cleared medical robotic platform that offers interventional cardiologists precise procedure and stent positioning control during vascular interventions. Offering healthcare robotics gives patients access to innovative technologies coupled with robotic precision. In addition, the development of a comprehensive Vascular Robotic Program can improve radiation safety to the physicians and staff who spend their lives devoted to caring for others. In order to successfully implement a comprehensive Vascular Robotic Program, it is critical for bedside staff, which may include both fellows and allied health professionals, to be willing to learn new technologies and commit to investing the time and effort needed to master new skills. The Corindus team offers Advanced User Training (AUT) courses to continue educating cath lab staff to help build and advance their vascular robotic skills with CorPath GRX. Our courses are a full day of hands-on learning held throughout the year, targeting Technologists, RCIS, RN, CVIT, CIT and others in the cath lab.